He doesn’t need an introduction but we’ll give him one anyway: World Champion medalist, skatepark god, 1080’s while injured, chickenbooooots, Ride Tour, mountainboard filmstar, beef jerky fiend, Rey De La Montana, Fox Racing honcho, Colab deck manufacturer, Legend. Part One: Let’s time tunnel! Hey Man! What sort of kid were you, back when you started this crazy lark in the late ‘90’s? What other stuff were you into, and who did you go out riding with? Your first ever comp was Sandhill Ranch, May 2002. We heard the track was pretty flat for that first event… Though I guess that helped you perfect your pumping skills? K: haha so flat! It was a BMX pump track, but it was a blast. All the riders were usually pretty close together so it made for some good racing. But you would ride that pump track until you literally couldn’t stand anymore. We know there were lots of old skool names around at this time just having fun on ‘dirtboards’ as they were mainly known. Ted Jones, Bud Holst, Hooterville, Scott Jones, Krazy Kris Kidwell, Nate Harrison. Then meeting Akoni (Kama), the Bomb Squad, Dirtheads and more at the events must have inspired you. What was the scene like for you then? K: It was awesome. I was a starry eyed kid so those guys became legends to me pretty quickly. I met AK in Hawaii. He tried to take me surfing and I almost drowned. Then we went riding and it was such a cool experience. Him and the old pro surfer Tim Conklin were throwing down and someone threw a backflip, which was huge back then. We became friends pretty quick and we’ve been practically best friends ever since. Though I don’t know if that is a good thing or a bad thing! But yeah, the whole crew…Leon, Austin, Saer, AK, Jereme, Sansone…the list goes on. They were pushing the sport so hard and I just tried to keep up. The stories are literally endless!! They have had such a huge impact on my life and I’m so glad mountainboarding brought us all together. Getting signed as a pro (to MBS) must’ve been cool. K: It was pretty exciting. It happened at Donner Summit in 2003. J Lee and I had been emailing already and then I started trying 7’s that day. Mitch Stegall later told me that he called J and said he had to sign “this kid”. I went home and had an email saying I was on the team. Back then it was free boards (Razors of course) and parts all the time. It was so cool being supported to push the sport. Trick-wise you progressed well into these heavy rotations and the one-footers. You must have been riding all the damn time at this point? K: Almost every day. It was and still is my passion. We had an awesome skatepark close to the house with vert ramps, roll ins to jumps, foam pit, and really nice rails. I rode there almost every day until it was tore down. Actually that was P-Rod’s home park as well so we used to bump elbows all the time and hang, haha name drop. But one-footers came out one day and I was hooked. I actually grabbed them in the beginning but became lazy over time and stopped grabbing because it was less energy not having to bend over. 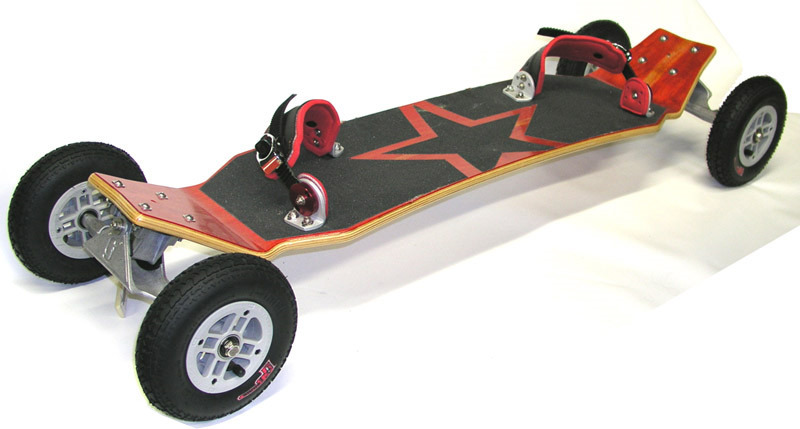 I actually started riding a mtnboard because I didn’t like skateboarding when my feet weren’t attached. I didn’t like snowboarding because I was strapped in. Mtnboarding was the perfect inbetween where I could ride almost anywhere and still have my feet free. K: Yeah, Pretty surprising. It was my first “Pro” contest ever. I had taken the Junior Championship in 2002 and then all the riders forced me pro in 2003. Jereme and Sansone were charging at that contest with grabbed 7’s and rodeo’s but had some slideouts. I just rode consistent and luckily kept it 4-down. The best part was getting the call from J Bisson from ATBmag a week later. He said that no one knew about it but the winner of the Venice Beach Core Tour was getting flown to England for the summer… That is really where things started to turn for me. I was just out of high school, didn’t know what I wanted to do in life, and getting on a plane destined for the UK. The last thing my Mom said before I got on the plane was “You should really think about going to college.” I laughed and walked into another chapter of my life. We bet she’s proud of her boy Yeah the mags (O.R.B & ATBmag) were creating a massive international buzz at this point. There were companies springing up all over the place. What would you say everyone’s hopes and dreams were for the sport back then? K: Just to make mtnboarding huge. We all had hopes and dreams of the sport blowing up. We loved the sport so much and wanted to expose it to as many people as we could so that we’d get more people to ride with. The most amazing thing about mtnboarding is the mtnboarders. It doesn’t matter where you are from, we somehow are all pretty like minded. But back then it was all about progression. Bigger jumps and bigger tricks. After that all died down mtnboarding went into a more street/techy state. Yeah it all got pretty rock n’ roll; Look what happened that summer in the UK! Rumour has it you dialled 1080’s with a broken wrist? K: Haha, I just couldn’t stop riding! It was broken but with all the trips happening there wasn’t any time to stop and let it heal. I wouldnt say I dialed them but I was getting them around. I remember landing my first 7 and 3 one-footer at NASS Peterborough in 2003. Then headed back to Kirkman’s house. We were checking out the footage and I couldn’t help but think that I could add a couple more rotations in there. Then the 9 was landed at Bath & West and thought I might as well keep going. They looked horrible back then though. Then came Town & Country festival where you took the ping pong trophy haha, & the epic WFC’s Arctic Challenge… What do you recall about those times? K: Everything was just getting bigger and better. Tom was charging back then and it was insane to be able to watch him come up in person. The ping pong trophy was because I’d been riding the “new” GI torsion cube trucks, which didn’t work the best... I wobbled, hit the scaffolding, and blew my ankle out so I couldn’t ride. I’m a fairly decent ping pong player though so I entered a contest and ended up winning, lol. Had to stay busy I guess. I could write a book on the Arctic Challenge alone, seriously. If I was to graze over it it would be the heater situation, the pro and am rollins built on the wrong sides, Beiran’s fronts, Jereme getting knocked out, Sansone knocking himself out with the pole pounder, Ollie knocking over the plywood walls that were being painted, the American Pizza Hut buffet trips, AK’s shenanigans, the last party, Alexey vs the windshield, all of us trying to get to the airport the next day, and the hotel room with literally 14 people in it. Those were the “good ol’ days” though. We were accepted in action sports and thanks to some amazing people we were making moves in the right direction. Here here. Among the Brits, you got a name as a real character during The Arctic Challenge for the cowboy hat, beef jerky and crazy nickname- as well as the obviously sick riding! Yeah ‘Chickenboots’ was shouted at you regularly then, especially just as you were about to drop in. Doesn’t it come from some Chicken burger packaging or something? K: Yeah, Moab 2002. We had driven like 12 hours to get there and were so out of it. We went to a Burger King and there was this chicken with huge boots on the packaging. We laughed about it and started saying chickenboots that trip as a joke. Then I got the nickname and it stuck. I liked it at the beginning but that wore off pretty quick. They used to get the announcers to yell it because they knew I didn’t like it anymore. Gotta love your friends. So anyway, as you said, you were getting involved with growing board manufacturer Ground Industries. Akoni had moved over too, what was going on? K: Amazing things. It started with the whole MBS switchover thing and them cutting back on budgets. If you weren’t the top guys you weren’t getting the best support. So I left and went to GI. They just wanted to come out with the best product and I wanted to see them do it. We cried spring trucks forever but they wanted to be different. Their decks, bindings, and hubs, were top notch! I was actually riding their plastic hubs until 2 years ago. They stood behind us. We were paid, our voices were heard, we had travel budgets, we had incentives, we had tours! It was great. They were the reason we went to Brazil. But a lawsuit between investors brought it down, which was horrible. Not many people know but they had just made the best mtnboard ever produced. Angled spring trucks, foam core deck, lightest aluminum hubs. It was stunning. But it was only available for a month. K: Actually the guy that won the “King of the Mountain” contest in Colombia in 2015 won on one of those boards! I was tripping! Talk about a blast from the past. Setting up GI boards again was super fun. K: Well I’ve learned to never trust anything until it actually happens. So AK (Akoni Kama) had told me he was going to bring me down to NZ to stunt double for a couple of actors. I didn’t believe him until Disney called me one day as well and asked if I could go. I asked when and they said TOMORROW! I was like you guys are crazy. Their office is about 10 minutes from where I live so I rushed the passport over, packed, and then jumped on a plane within 2 days. It was gorgeous down there. Leon and AK built one of the funnest courses you’d ever be able to ride but it was tore down after shooting. We went and all doubled different characters. I ended up doing 3 characters including the main and playing myself. We were always busy doing things though so we didn’t get to explore the island too much. Once in a lifetime experience and all of us that worked on it together still chat and hang out from time to time. We were there for over a month and if you know AK, Leon, Slater, Cronin, and Joe…there was tons of trouble to be had. K: That was my best year and the last year really for US Competitions. We lost the US Open after that and I think that really tied us all together here in the States. It’s such a big place it just couldn’t sustain that amount of comps! But it’s not just all about events. Your promo vid from a few years ago (at the head of the page!) showed off the versatility of your riding: it has this freedom of mountainboarding, to explore terrain and innovate and just play and have fun with it. K: We call it mountainboarding but it truly is an all-terrain board. You can ride it most environments from the mountains to the skatepark, to just riding around town as transportation. And how do you feel personally about the different sides of riding, do you have any preference these days, to Big air, or BX, or freeride? K: I love it all. The riders get to express themselves everywhere! From dirt, to grass, to concrete, to wood. We get to ride everything. In Part 2: World Boardercross, Colab Mountainboards and more. Coming soon.